I have had a box in my parts collection for a few years that contains a variety of interesting vintage components. The most prominent are the Intel 8035L microcontrollers. These microcontrollers are from the Intel MCS-48 (commonly known as the 8048) line. They have 64 bytes of RAM and access to 4096 bytes of external program memory. Thankfully they are not the one-time-programmable (OTP) variety so I am free to put them up to any task. These processors have a copyright date of 1977 which puts them at roughly twice my age. There are also a couple of different EPROMS: D27256, with a copyright date of 1984 and D2758 with a copyright date of 1977. Obviously whoever owned these components prior to me was building some interesting embedded systems. They are in relatively good shape. I would say that these are socket pulls. They have some signs of prior use (adhesive on the quartz windows). These may have also been "development" units. These components coupled with my new EPROM tools were enough for me to bring this vintage processor online. 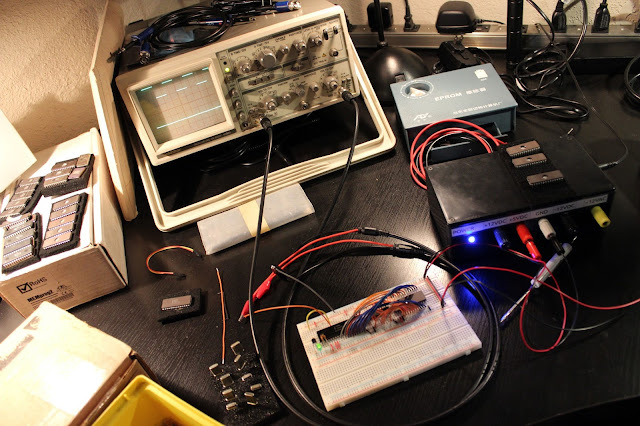 I managed to get the classic blinking LED working as shown on the top trace of my oscilloscope. Continue reading to see how I did it! 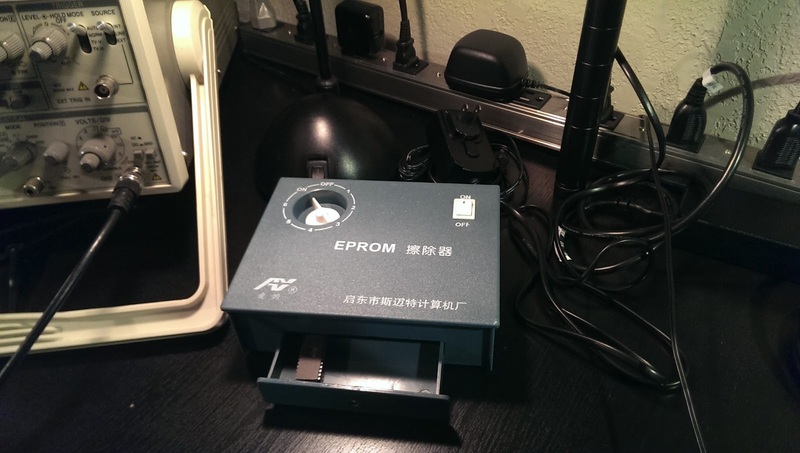 I have ordered some tools to experiment with EPROMs. 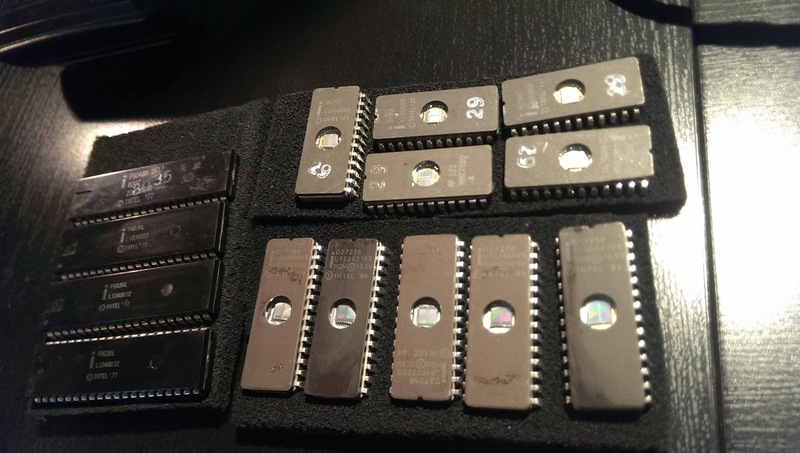 I ordered a "Universal Memory Programmer" that goes by the name MEMprog2 from eBay user cosmicmedevac. The unit arrived quickly and very well packed. I was able to load a file onto an old Intel D27256 EPROM that I have and then read the file back successfully. 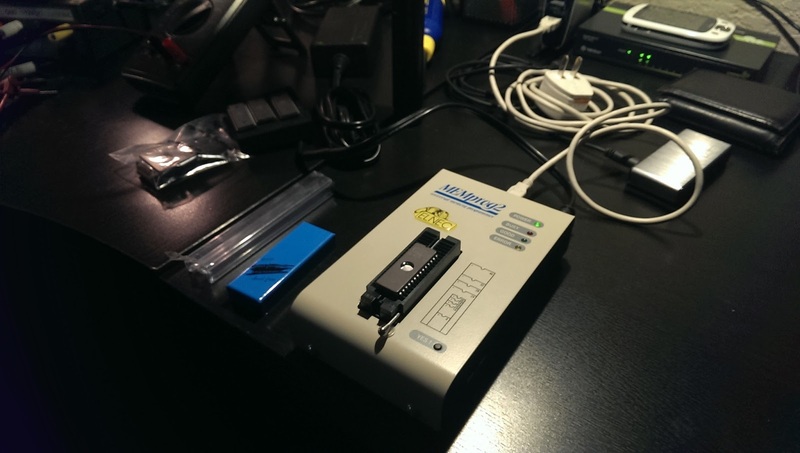 The programmer is a very nice piece of gear with device coverage of over 15000 units. I have also ordered a very low-cost EPROM eraser from eBay user techex_us. This unit also arrived quickly and well packed. It is definitely a piece of gear that I do not plan to leave connected to mains unattended. The entire device feels quite cheap. The AC power cord is thin and the rotary dial seems to have a mind of its' own. The one small piece that I do trust is the mains power switch. I can't complain for less than $25 shipped. I had no trouble erasing a few EPROMs in this little oven. I am quite happy with the product despite its' quality shortcomings. I have a box of Intel 8035L microcontrollers (from the MCS-48, 8048 line) that have been in my collection for a few years. They have a copyright date of 1977 on them. I plan to bring one of these processors online on a breadboard. It should be interesting to experiment with a processor that is nearly twice my age.